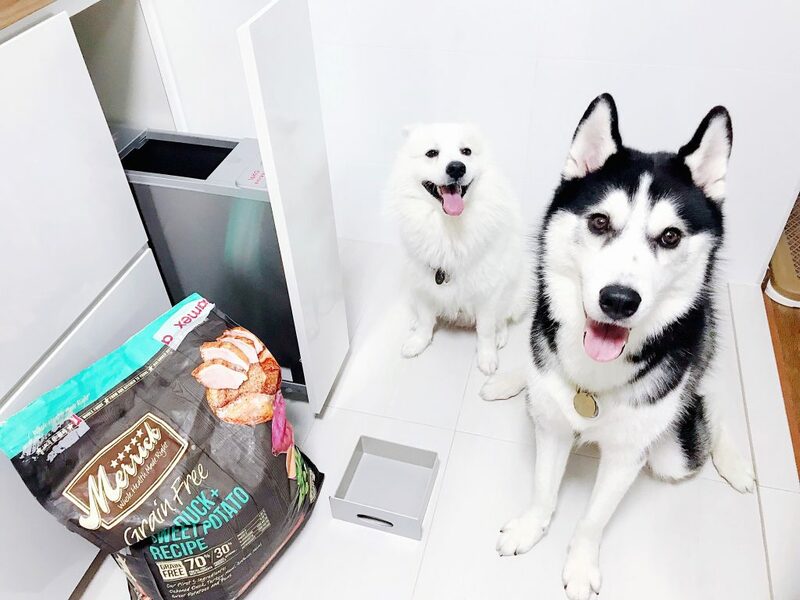 Yandao the Spitz and Lengzai the Husky used to be on kibbles and freeze-dried diet. My personal choice of kibbles was the Merrick Grain Free Real Duck + Sweet Potato which costs about S$160 for the biggest 25lb bag. This would last them approximately 3 weeks. 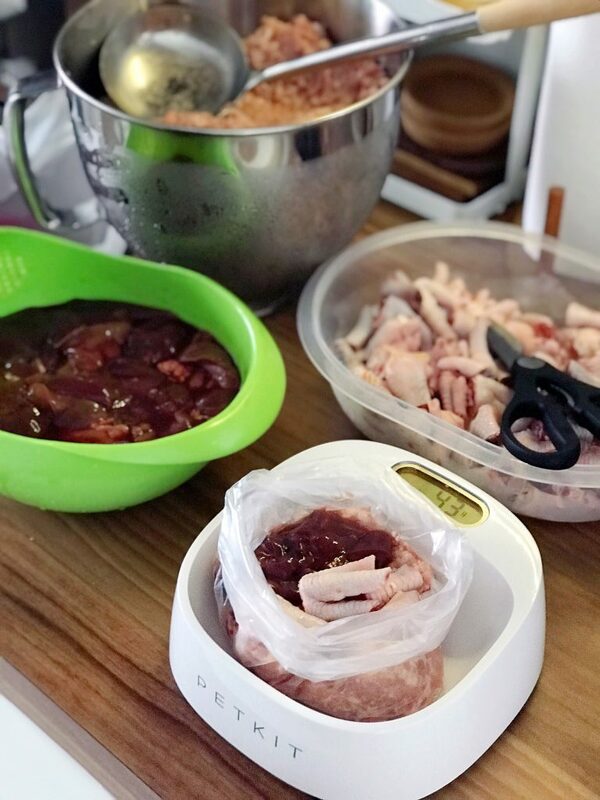 Meat (steak + minced chicken), Chicken Liver, Chicken Feet, Pureed Vegetables and supplements. The general rule of thumb on how much to feed your furry friend goes from 2.5% to 3% of your dog’s weight. It also depends if you wanna maintain, increase or decrease your dog’s weight based on its health level. From that weight, I generally divide it into 80% meat, 10% bones, 5% liver and 5% other offals. One size does not fit all, though. You have to try and tweak the formula for your dog since no two dogs are 100% alike. I started off my journey from following the formulas strictly down to the exact grams, giving them different kind of meat (brisket, heart, lung, etc), organs, liver and bones. However, as time passed, I realised that they absorb the nutrients better when I give them a single core of ingredients in the individual category. This means 1 kind of meat (either Chicken/Beef/Duck), 1 kind of bone, liver and offal, respectively. Raw Guidline by Boo – This greatly helped me to figure out the eligible items for each category of feed! Thank you, Boo! Oh, and ever since I started the boys on their raw diet, I became way more obsessed with their poo! I actually order whole Hormone-free Chicken Thighs from the meat suppliers. 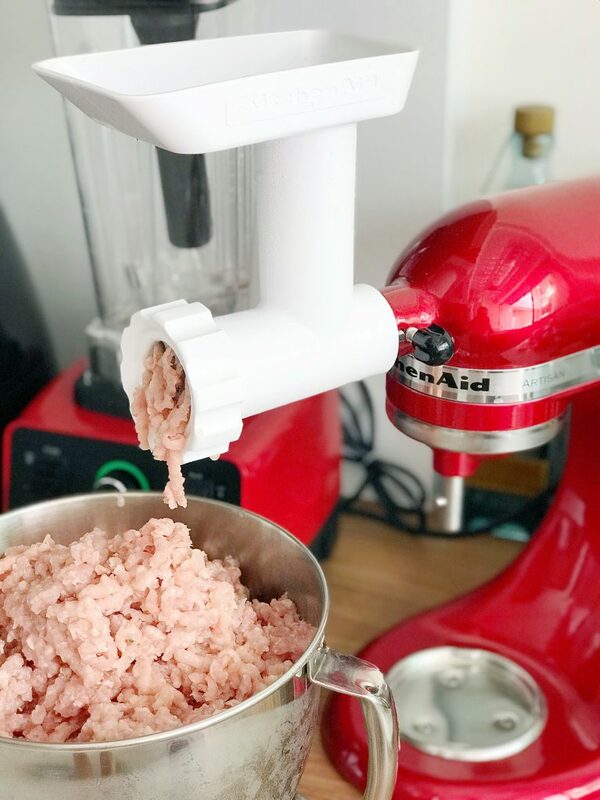 But then I proceed to DIY grind them myself because firstly, I want to make sure that the meat is actually thigh meat, and secondly, the boys tend to absorb ground meat better. My kitchen SMEG fridge is simply too small – thus I had to get a mini-bar freezer just for the boys’ raw diet. The maximum that I can pack with my mini-bar freezer is about 22 packs of raw feed. This means that every 11 days, I will need to order and prepare the boys’ raw diet. Here’s also where it gets fun and.. messy. Did you know that chicken feet is actually a fantastic source of collagen and bones for your furry friend? However, it is crucial that you trim away the nails of the chicken feet to make sure there are absolutely no sharp edges that might cause any unfortunate accidents. In place of chicken feet, you can also feed beef tails, duck necks, etc – but from my experience, those were a nightmare to handle. It’s extremely difficult to chop, given how thick the bones are. Every chop for those parts seems to drain all my energy. 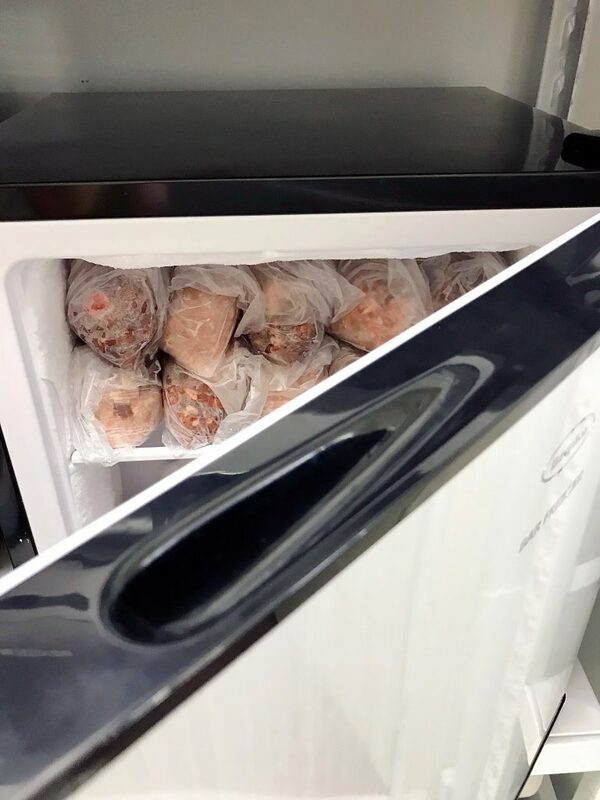 Usually, I will thaw the frozen meats slightly by putting all the ingredients in the chiller overnight so that it will be much easier to pack. I keep it a point not to defrost the meats totally so as to lower the risk of bacteria growth and potential contamination. 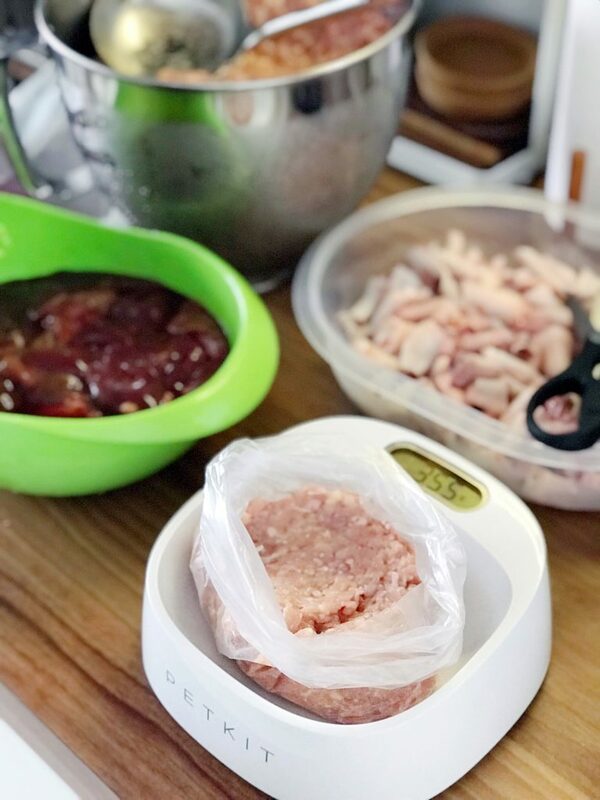 Firstly, as what I’ve mentioned above, I find that my two boys react better towards ground meat and that I’m able to squeeze more packs into my already small bar freezer. Secondly, the furry boys still do need to chew because it’s after all still bones (duh! ), and I do give them other dental treats from time to time. We (Asian) humans mostly have rice as our staple. But for our furry friends, the staple is of course meats! I usually layer the meat at the bottom of the pack first. This constitutes about 80% of the total diet. Usually, I will put a little more than required to offset the moisture and air, so that when I defrost it, the serving will be just the right serving size. You might wonder why I used (cheap) plastic bags as per the above photo? Anyway, whichever method you choose to pack, do make sure it’s freezer-safe (some containers will crack when they’re frozen – be warned)! This is then followed by the more bloody stuff – liver and offals! Never, ever, place the bones at the bottom of the pack if you’re using a plastic bag! 10 out of 10 times frozen bones will never fail to pierce through the bags causing a leakage. Most weighing scales actually have a reset function. You can use that function to reset the weight for each type of raw feed you pack into the meal! My tiny mini bar freezer… packed full! Here’s how a mini-bar freezer with 22 packs (11 days) of raw-feed packed to the brim looks like! Usually, I will double pack each pack with an extra clean plastic bag individually before I store it in the freezer for hygiene purposes. Supplements wise, I usually get it from iHerb as they provide the most competitive prices by far, and their shipping is insanely fast, too. 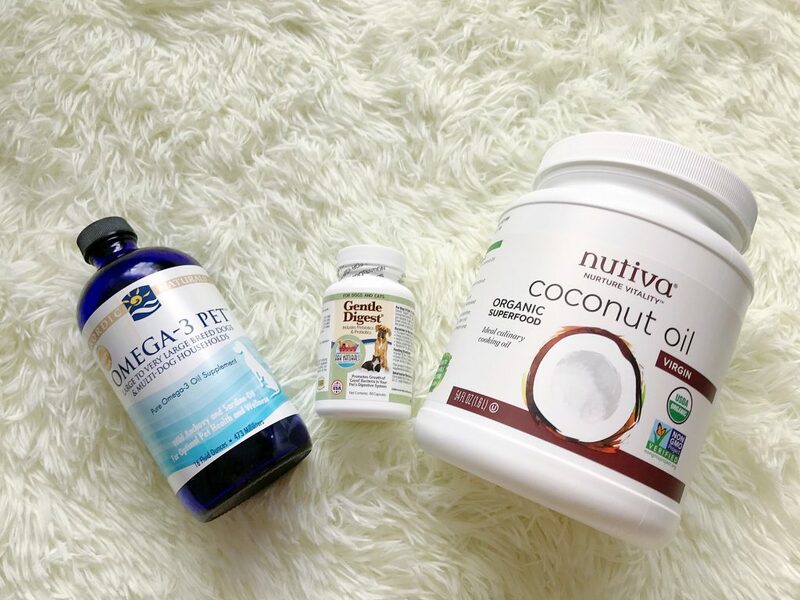 Mainly, I give the boys’ probiotics to help with their digestion, and a little bit of fish oil and coconut oil for better fur texture and to add a little bit of shine. 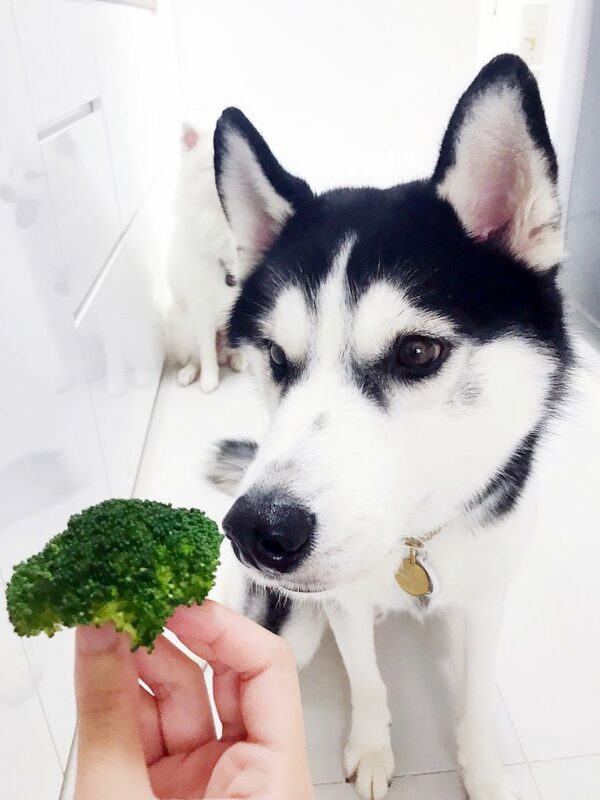 Especially for Lengzai the Husky who loves his carrots and broccoli more than anything else. Yandao the Spitz, on the other hand, hates greens. 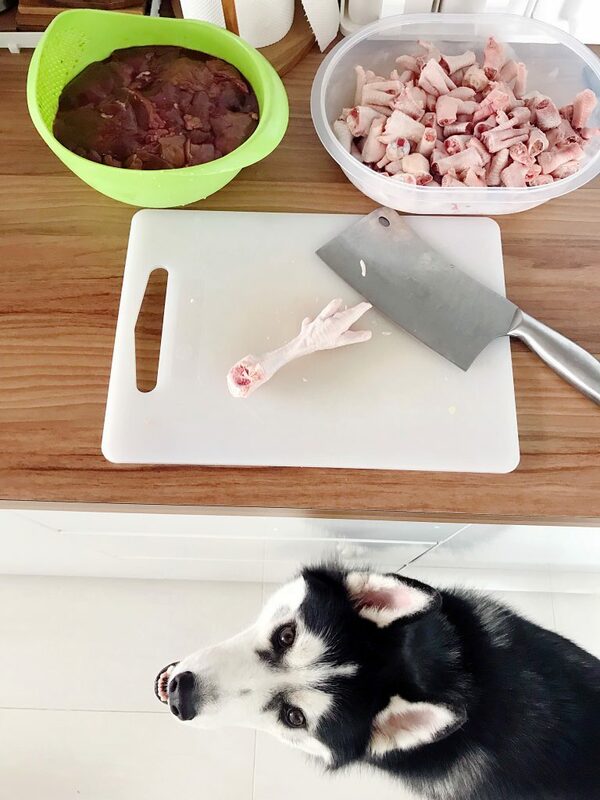 You can read here on how do I prepare and make bone broth and veggie purée for them [How-to] Making Bone Broth & Vegetable Purée for your Furkid in Singapore. Nom nom nom.. We love our raw diets! Erm, nope. Because I prepare the ingredients myself. You could go with prepacked solutions, but there’s in hefty markup in that. On the average, I spend about S$160 – S$200 monthly on basics (meat, liver, offals and bones) excluding add-ons. How is the Transition from Kibbles-to-Raw-feeding Like? 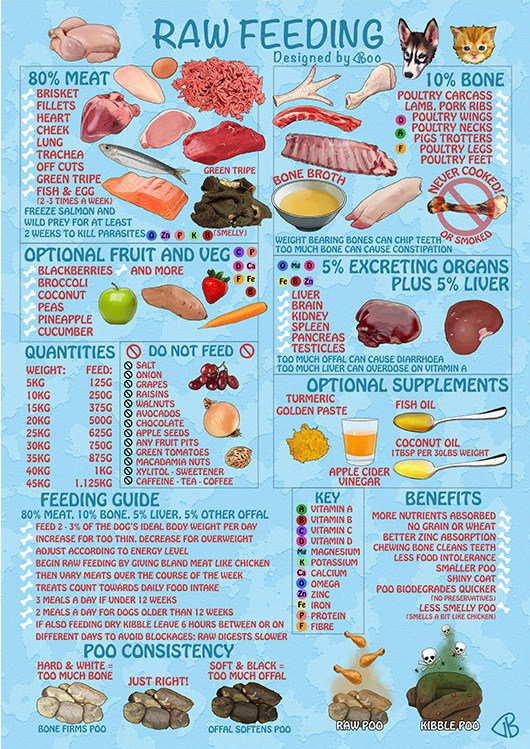 Some say you should introduce raw little by a little, while others say do raw meats first, followed by liver and offals. I guess different people have their own opinions on how you should transit your dogs(s) to raw. 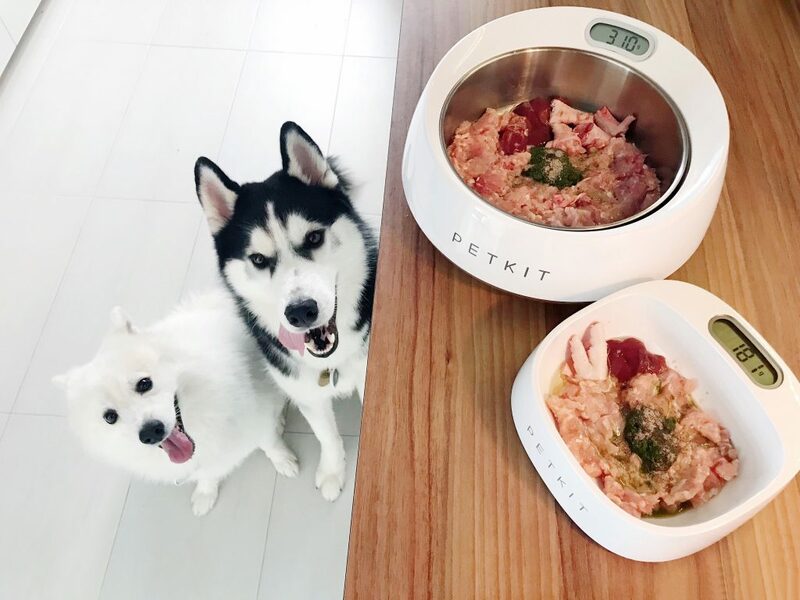 Will Your Dog Crave for Blood or Bite Humans Since They’re Eating Raw Meats? Well, you’ve eating meat such as beef tartare, salmon sashimi, etc..
Is it Difficult to Prepare Raw-feed Yourself? Nope – it’s not difficult, it’s just really time-consuming. It’s freaking troublesome and damn sai kang but the savings I get from it is really significate. If you have the budget or simply feel a little rich, go for the ready-packed ones. There are a few good providers who will send pre-packed raw-feed to your doorstep weekly! Isn’t it Better to Feed Fresh Meats Instead of Frozen? Nope. I initially thought the same way as you too, and I learnt my lesson the hard way. 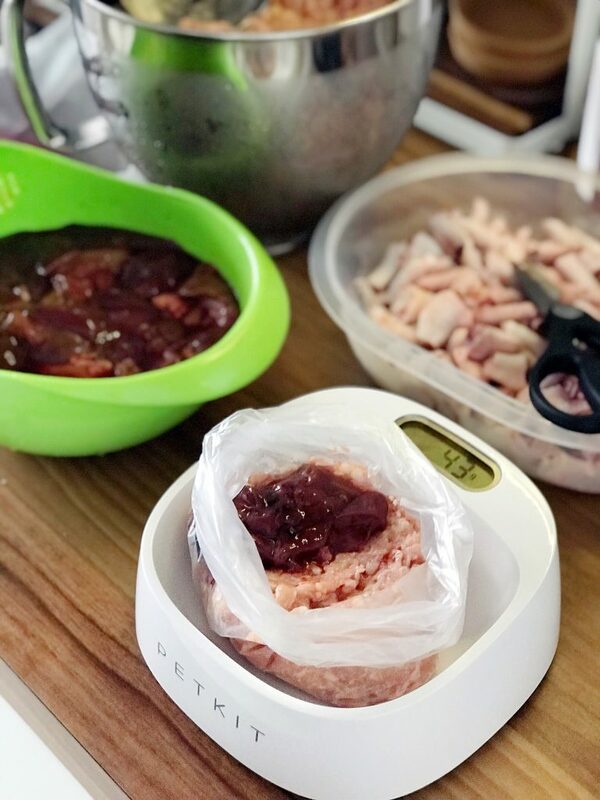 We started off with fresh chicken and beef from the supermarket initially till the vet told us that fresh meats in Singapore isn’t exactly fresh due to our production cold-chain processes. Lots of bacteria are actually accumulated along the way – even when the meat is left cold but not frozen. This is because fresh meats have never gone through a deep-freeze process at point of slaughter to eliminate almost all bacteria. That’s why frozen meat is a better choice as there is significantly less chance for contamination. This is the same logic as our salmon sashimi which we all love eating in Singapore – not every salmon is sashimi-grade! The sashimi-grade ones are usually deep-frozen at point of capture! Where Do I Order Frozen Meats? There are quite a number of suppliers such as Omni Frozen Food, QB Food, Ben’s Food, etc. Yeap. Those are the exact same places as where you would order ingredients for your barbeque. I mean feeding your furkids the best also means feeding them with human-grade ingredients, no? If it’s not safe for humans, why would you want to give it to your furkid? 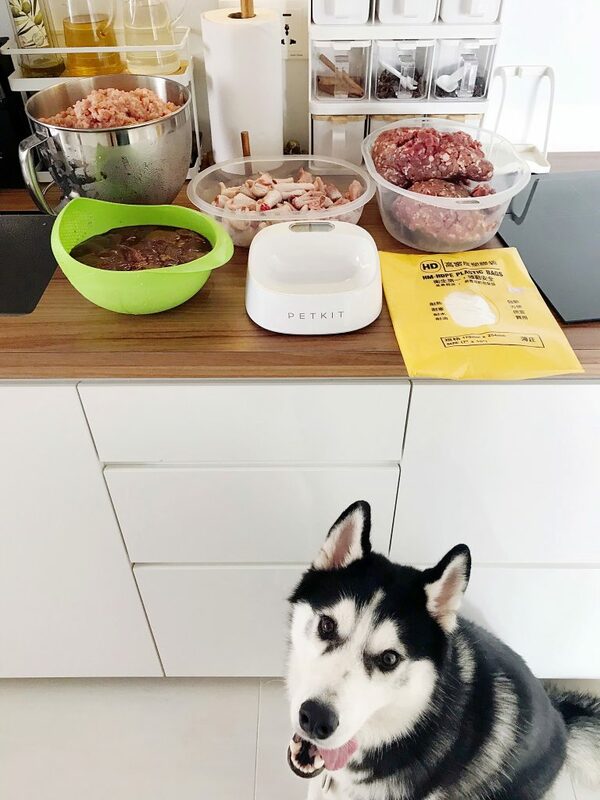 That said – welcome to the journey of raw-feeding your furkid! You’ll notice loads of positive changes really quickly, and you’ll have a lot of fun along the way experimenting, too. So thankful for your insights on raw feeding. Would like to ask on the amount to feed based on 2% – 3% of furkids’s weight. Is this ratio for a meal or a day? I feed my cats raw food too. I’m thinking of grinding up his food too but grinders seems like such a hassle. So I wanted to ask, what grinder are you using? How much does it cost and is it difficult to clean? Regarding transition from kibble to raw, they whole idea of doing it slowly is to prevent the diarrhea! Since when you change food types the stomach also needs time to adjust. But once they have fully adjusted the poo should be lesser and also not as smelly! As for the freezing part, it’s good to freeze for at least 2-3 days to kill most parasites. However, bacteria might not necessarily be killed. This is not a problem though because their digestive tracts are shorter and the bacteria will just pass through without doing any damage. Thanks for the tips! I’m using Kitchen Aid with a meat grinder attachment. Do note that it wouldn’t be strong enough to grind bones. Cleaning-wise, it is pretty easy to clean because it can be dismantled and also dishwasher safe. 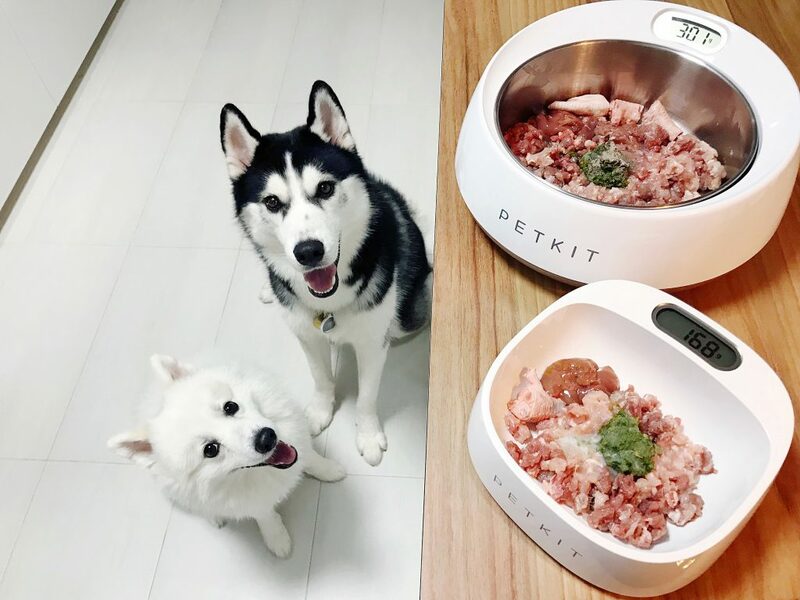 Hello, wanted to get the petkit bowl for my dogs too as I need the weight function because I’m feeding dehydrated meat. May I know how long have you been using them and where did you get the bowls? any comments on the bowl? Especially for the smaller one which do not come in a stainless steel removable bowl, how’s cleaning and all? Very curious did you use their smart function as well. I have a medium and large size dog as well! Hi! I got mine directly from the Petkit official store. They claim that the small smart bowl is waterproof but sadly the one I got shows otherwise. It lasted barely a few months and weighting function went haywire. I open up and saw inside is full of rust (no waterproof sealing as they claim) which is extremely dangerous. I would recommend you to go for the big one as you can remove the stainless steel bowl for cleaning. Way much safer. The small Petkit smart bowl was just nice for my spitz. The big one was for my husky. For that, I clean and disinfect the exterior using a kitchen towel with a little soap after every meal. 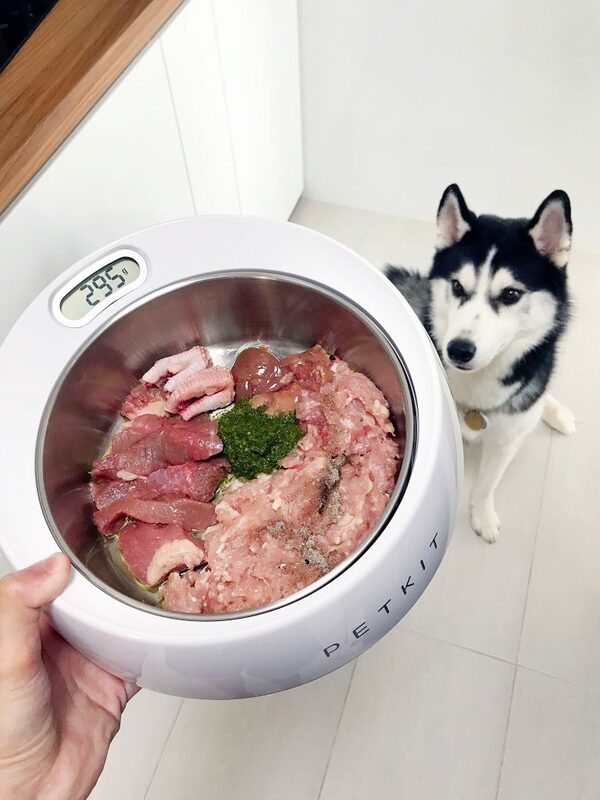 The Petkit smart bowl is good if you need to portion and weight each meal. For me, their raw is already portioned nicely for each meal thus I decided to change it to an elevated wooden stand with stainless steel bowl instead. Freezing doesn’t kill the bacteria, the reason why it’s ok to feed raw even though they contain bacteria ie because raw fed pets have Low pH level stomach acid that can handle bacteria. Hi, I’ve been feeding my 12 week old golden retriever puppy breast meat (added chicken feet for the last 3 days) for the past week and he is still having loose stool. Is that normal? How Long will it take for loose stool to firm up? Thanks! Hi Cher! I only started feeding my boys’ raw diet when they turn adult. I add slippery elm in their meal to soothe their guts/stomach or add more raw bones when they have loose stools but I’m not sure if it will be suitable for puppies. 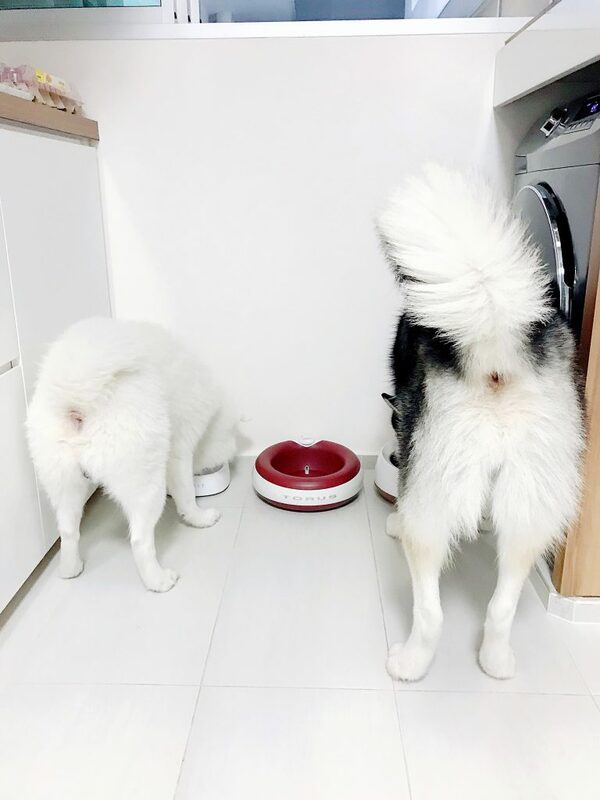 Yandao the spitz doesn’t have much issue other than soft stools during his transition to raw where else Lengzai the husky went on full blown diarrhoea spree for the whole week. You might like to check with your vet for more accurate information! Hi, thanks for the reply. 🙂 May I know where did you get your slippery elm? Hi Rosy! Yandao the spitz didn’t go through the diarrhoea spree, the most he got was just soft stools. Lengzai the husky on another hand experienced the full-blown diarrhoea spree but despite that, he was still very active. I add slippery elm in their meal to soothe their guts/stomach or add more raw bones when they have loose stools. Hi. Do you buy frozen, thaw and refreeze again? Hi Phyl! Do only get frozen meat that went through deep-freeze before. For me, I let it thaw slightly – just enough to for me to cut and portion the ingredients. Once it’s done, I refreeze their portioned meal back to my freezer lowest degree (which is -24º) for at least 5 to 6 days before feeding them.